(Franciscan Media) Born in Italy Agnone a city famous for manufacturing bells and copper crafts, he was given the name Angelo at Baptism. Angelo attended the local school run by the ‘Conventual Franciscans’ and joined them at the age of 16, completing his studies for the Priesthood in Assisi where he was Ordained in 1705 — Further studies led to him receiving his Doctorate in Theology and appointments as Teacher in Agnone, Ravello and Naples. Bishop Lucci’s 23 years in his position were marked by visits to local Parishes and a renewal of Gospel Living among the people of his Diocese — Bishop Lucci dedicated his episcopal income to works of education and charity. At the urging of the ‘Conventual Minister General’ Bishop Lucci wrote a major book about the Saints and Blesseds in the first 200 years of the Conventual Franciscans. In 1989 Pope Saint John Paul II Beatified Bishop Lucci, three years after his close friend St. Francis Fasani was Canonized. Wikipedia. 2016. Antonio Lucci – Wikipedia, the free encyclopedia. [ONLINE] Available at:https://en.wikipedia.org/wiki/Antonio_Lucci. [Accessed 28 July 2016]. Cristy Li. 2016. 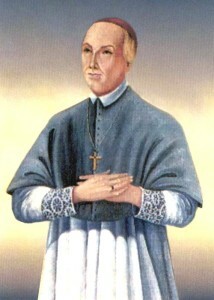 » Today Christians Honor Blessed Antonio Lucci Cristy Li. [ONLINE] Available at:http://www.cristyli.com/?p=30424. [Accessed 28 July 2016]. Posted in Beatification, Feasts and commemorations, Reblogged, Religious OrdersTagged Assisi, Christianity, Conventual Franciscans, Doctorate in Theology, Pope Benecist XIII, Saint of the Day, Teacher in Agnone, Ravello and Naples.